Rowena grew up in a poor area of the Philippines and has endured much sorrow in her life. Her three brothers, mother, and two of her grandparents died when Typhoon Haiyan slammed into the country more than five years ago. That same year, her husband died of complications related to high blood pressure. “My life has been a miserable life,” Rowena shared honestly through her tears. 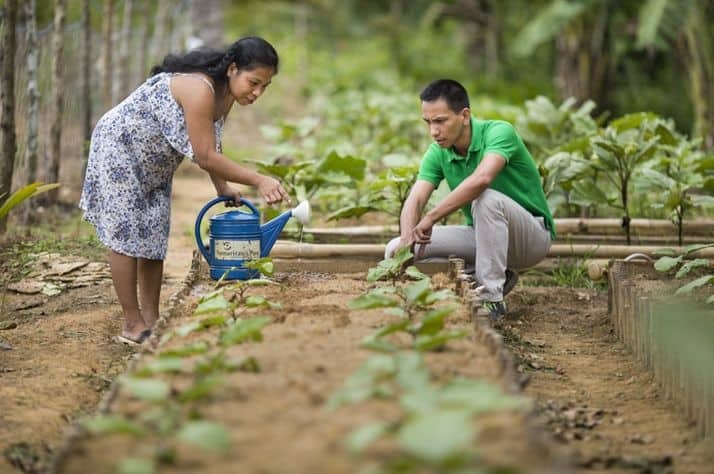 Though she’s suffered much loss, Rowena has been encouraged in recent years as she’s learned from Samaritan’s Purse staff how to grow income-producing home and community gardens. We’ve also taught others struggling with poverty how to raise pigs so that they can sell them in the local market. Rowena, 35, was living near the coast in a squatter’s area when the typhoon roared ashore. Her home was destroyed and Rowena and her husband moved inland—back to her hometown—to be closer to her father. Sadly, both her father and husband died not long after they moved back. Rowena was left to raise her two children, ages 3 and 2 at the time, on her own. “I prayed for God to help me and to give me strength,” Rowena said. Rowena and her husband both became Christians in the weeks following Haiyan, and her faith in Jesus carried her during her darkest season. “Everything is for God’s purpose. He is good to us,” she said. Samaritan’s Purse staff helped Rowena grow in her relationship with God and trained her to become a ministry partner, a role that allows her to share the Gospel and to encourage other Samaritan’s Purse livelihood beneficiaries in their faith. As a participant in the livelihood project, we taught Rowena how to grow vegetables in order to provide extra food and income for her family. Trinidad is 66 years old and she, too, lost her home to Typhoon Haiyan. A widow, she lives with one of her children who is sick and cannot work. La Perisima, who lives in a village not far from Trinidad, is now also raising pigs and growing vegetables. Although La Perisima’s husband works hard in construction, he struggles to maintain consistent employment. La Perisima is grateful for the extra income and is enjoying the opportunity to raise pigs for the first time. She also attends church with one of our ministry partners and, despite her financial struggles, has been encouraged to “have faith and to believe in God,” La Perisima said. Samaritan’s Purse provided Trinidad and La Perismia with livestock, pig pen materials, and training on how to build the pig pen in order to reduce livestock odor. We also offered financial management training. Most important, our staff is committed to investing in the spiritual lives of the families we serve. We serve to share the Good News of Jesus Christ. Please pray as Samaritan’s Purse continues a variety of livelihoods projects in the Philippines to help those in poverty.